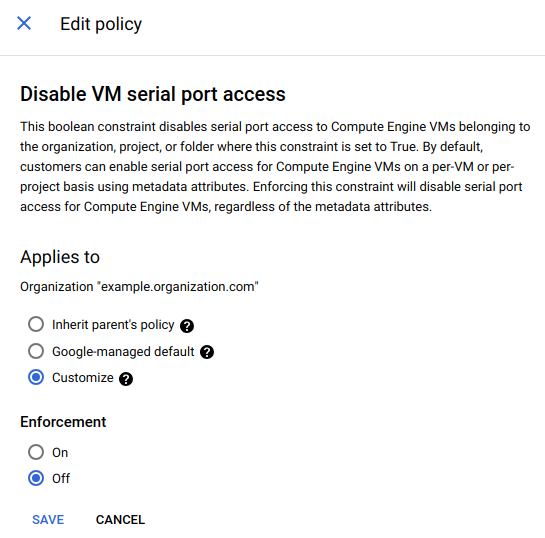 This is a beta release of the Google Cloud Platform Console UI for the Organization Policy Service. This feature might be changed in backward-incompatible ways and is not subject to any SLA or deprecation policy. 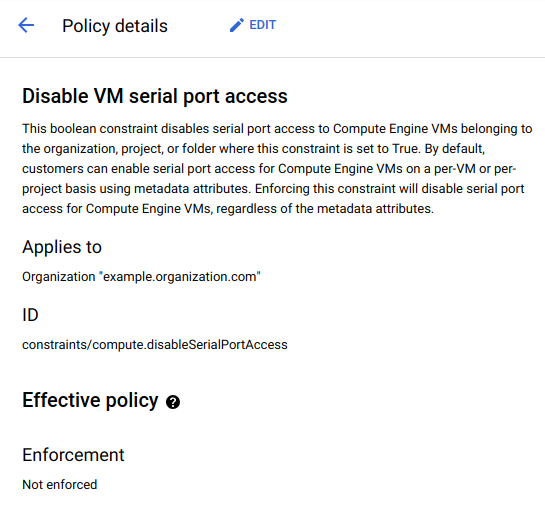 This page describes how to view, create, and manage your organization policies using the Google Cloud Platform Console. The Cloud Identity and Access Management role roles/orgpolicy.policyAdmin enables an administrator to manage organization policies. Users must be organization policy administrators to change or override organization policies. To set, change, or delete an organization policy, you must have the Organization Policy Administrator role. How constraints define the behavior of organization policies. How organization policies are evaluated at different levels of the resource hierarchy. Click Select, and then select the project, folder, or organization for which you want to view organization policies. The Organization policies page displays a list of organization policy constraints that are available. To filter the list by constraint name, enter a constraint name into the text box. To filter the list by inheritance status, in the Any inheritance drop-down list, select an inheritance type. To filter based on resources that have a set organization policy, which merges with the rules set by the parent resource, select Custom. To display the current inherited policy, click Edit. The inherited policy will appear on the Policy summary panel. For more details and step-by-step guides for using each constraint, see Organization Policy Constraints. Organization policies are defined by the values set for each constraint. They are either customized at the level of this resource, inherited from the parent resource, or set to the Google-managed default behavior. Click Select, and then select the project, folder, or organization for which you want to edit organization policies. The Organization policies page displays a list of organization policy constraints that are available. 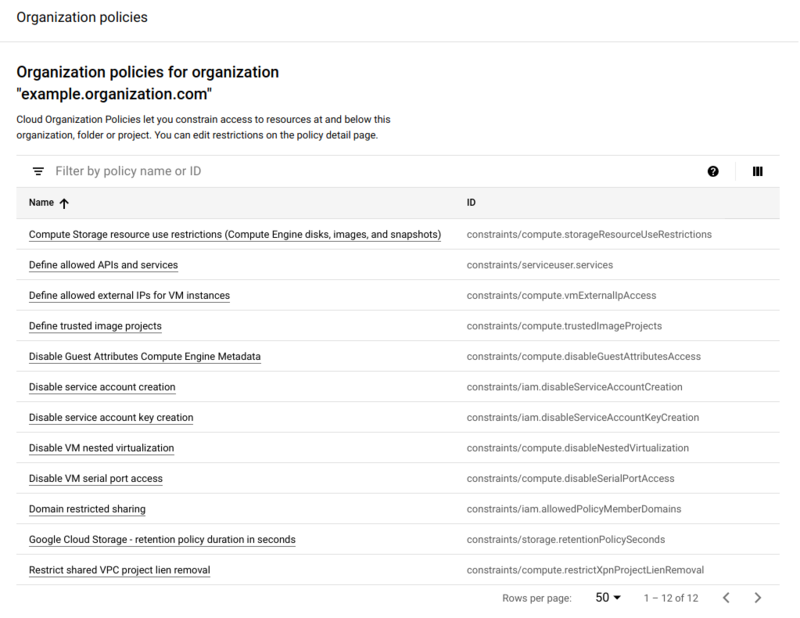 Select a constraint from the list on the Organization policies page. 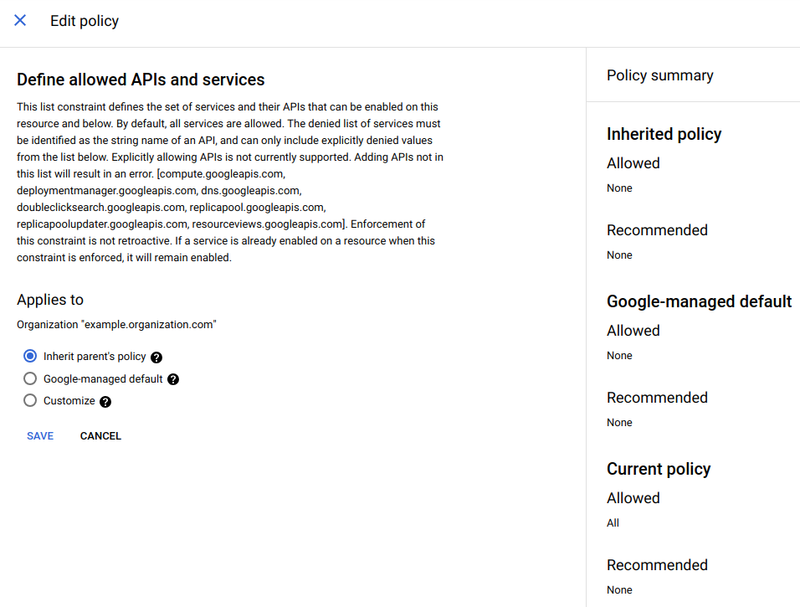 The Policy details page that appears describes the constraint and provides information about how the constraint is currently applied. To customize the organization policy for this resource, click Edit. On the Edit page, select Customize. To enable enforcement of this constraint, select On. To disable enforcement of this constraint, select Off. For gcloud command-line tool instructions, see the boolean constraints section of Using Constraints. To merge and evaluate the organization policies together, select Merge with parent. For more information about inheritance and the resource hierarchy, see Understanding Hierarchy Evaluation. To override the inherited policies completely, select Replace. To specify that the listed values will be the only allowed values, and all other values will be denied, select Allow. To specify that the listed values will be explicitly denied, and all other values will be allowed, select Deny. To apply the above policy type to every possible value, select All. To list explicit values, select Custom. In the Policy value text box that appears, enter a value and then press Enter. You can add multiple entries in this way. To set a recommendation for other users, click Set recommendation. To set the recommendation, enter a string value into the text box that appears. 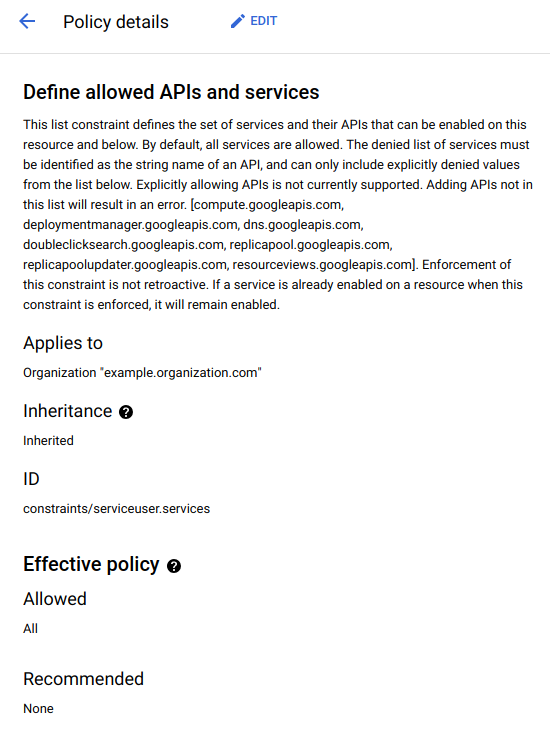 This string value will be displayed in the GCP Console to provide guidance to users about this organization policy. It is only a communication tool, and does not affect what policy can be set. To finish and apply the organization policy, click Save. For gcloud command-line tool instructions, see the list constraints section of Using Constraints. To make this resource follow the same rules as the parent resource for this constraint, select Inherit parent's policy. This is the default behavior for resources. 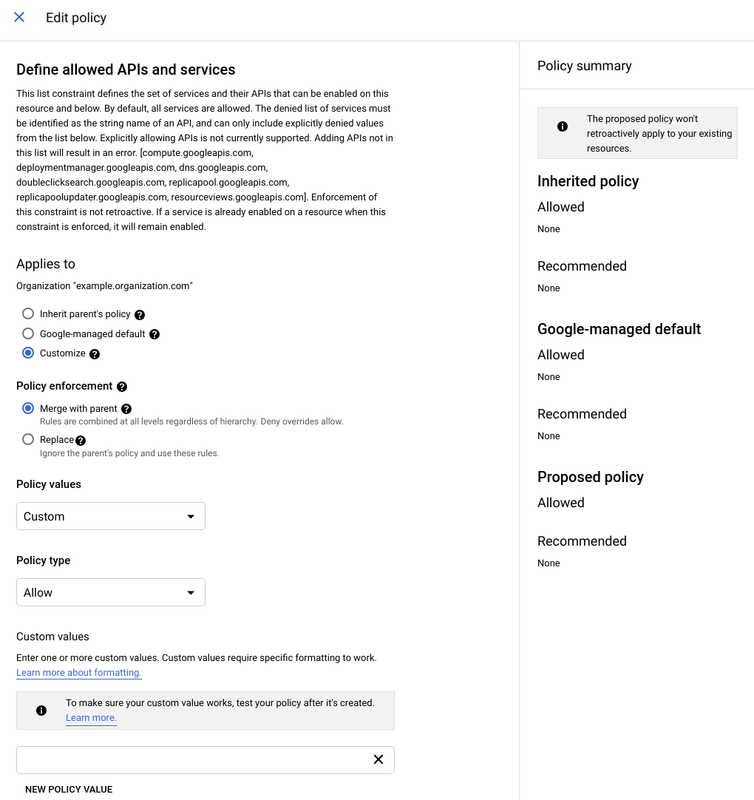 To override the parent resource's organization policy with the default behavior set by Google for this constraint, select Google-managed default.